2018 is slotted to bring the world ever-closer to the smart hospital. Aside from all the hype, what can patients, doctors, and administrators expect from healthcare technology in the coming months and quarters? We were lucky enough to speak with six experts from different parts of the industry to learn more–especially about the future of Bluetooth beacons and tags. 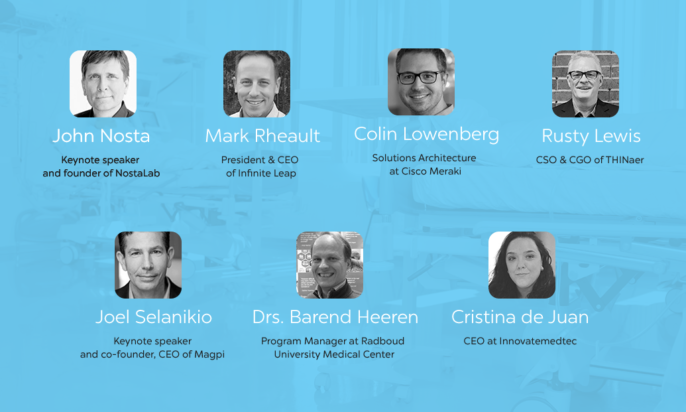 Let’s dive into how healthcare technology can help patients, the role of Bluetooth beacons, what’s holding hospitals back from investing more, and how administrators will really choose to invest their funds. How can healthcare technology help patients in 2018? What use cases can we expect from IoT in healthcare? While it’s clear the “smart hospital” is on the rise, many disagree on what that means, what will drive it, and how it will look. IoT will provide more contextual information from, and more interaction options with, patients. Based on the information, a hospital can decide if a patient needs to visit a healthcare professional or not. As opposed to the standard 4 times a year visit control cycle, this will save patients time from unnecessary travelling and taking hours off at work. It will also enable the hospital to call in the patients based on need instead of time. First examples are already visible in the Dutch care system, information mostly being derived from cloud based measurement devices and apps. The interaction opportunities, I find most interesting though. My personal goal is to deliver health instead of care. Without adequate patient self-management, this goal cannot be achieved. Even for disease areas in which a healthy life style is key, the actual interaction with healthcare professionals is about 1% of their time, meaning they are left with 99% of their time to manage the disease on their own. It is not a lack of information on how to live a healthier life, but the ability to practically use this information in your daily life in so-called micro-moments. That is the hard part in self-management. Virtual private assistants provide a great way to interact at any time with patients, either reactive to a question or pro-active based on the contextual information. By using a communication channel that is common in our daily lives, patients can be supported 24-7. I think more of these kinds of solutions will hit the health market in 2018. We have customers building their own solutions and buying beacons to use for asset tracking. The obvious benefit is for the hospital, not the patient. However, it does help patients, because hospitals are giving better service to patients by tracking wait times and measuring their journey. Much like in retail and hospitality, the big thing in healthcare tech technology is patient flow and satisfaction. The IoT can help by connecting health information collected on a patient’s mobile phone to the patient’s medical notes. IoT solutions are already helping improve the overall patient experience. We’re solving for challenges around inventory management, ensuring the right moveable medical devices – wheelchairs, IV pumps, scopes – are available at the right time. We really have to think outside of the box here and look beyond IoT and consider it IoL–the Internet of Life! I would even argue that patients might need to help hospitals and healthcare in the coming years. We already see a tremendous shift in roles and responsibilities and this is characterized as the fundamental change from control to collaboration. We know that patients already demand a great role in health and wellness and technology provides the connective tissue to make that happen. For me, the IoT is less a concrete reality than a more abstract notion that connect us all. In the final analysis, we need to turn to patients to demand higher levels on engagement and participation. Once that happens, IoT won’t help patients, but patients will help IoT. In the era of consumerism, patients expect the same type of service as they get when buying a car, visiting a grocery store, or dining in a restaurant. They want to be informed on their choices, understand the price, and get an immediate service. Although you should not directly apply these consumer expectations to healthcare, the reality is patients expect more and more from healthcare providers. That’s where I see a big role of IoT – helping patients find the quickest way to get to their appointment, showing them how much time they can expect to wait to see the provider calculated on current queues and flow rates, and sending automated and custom texts to patients and family members on the current status of a visit. They might seem trivial but they do directly impact patient satisfaction and the perception of the quality of care. These are just a few examples of over 120 uses cases that we have identified as feasible use cases for IoT. Want to learn more about IoT use cases in healthcare? Check out this on demand webinar with Infinite Leap. Will Bluetooth and beacons play a role in healthcare? Beacons are great to trigger interaction. We actually make use of them in different settings already. In order to keep patients active during their stay at the hospital, we created a walking route for them with different check-in points with bonus content. Another example is the use of beacons to remind patients to do physiotherapy exercises on different locations, at home, or at work, and the exercise is streamed to their phone. For employees one can think of safeguarding the usage of specialized equipment by checking training approval on the device or having maintenance or operating instructions available. In most cases the incentive to make use of beacons will be a combination of information on the right location with actual content at a lower price than paper distribution. Monitoring temperature and humidity of refrigerators can cost between $10 and $100 for each sensor. However, they can save you a million dollars in lost medicine when a fridge goes bad. With Bluetooth, you can track computers or beds, and you can identify staff, patients, and equipment. Doctors now have e-charts, and as they walk up with their iPad, they can see that the Bluetooth beacon nearby matches the chart of the bed and the patient. Avoiding confusion between two different patients is extremely critical for newborns and critical care. Today babies are born, doctors already use RFID to identify the newborns, and BLE is often replacing RFID. Safety is not necessarily quantified as a dollar amount for its ROI. You can calculate the ROI of medicine not being lost, but the ROI of safety is immeasurable. Bluetooth will solve real problems in healthcare, and some of the reasons are due to the technology. Bluetooth is better than WiFi because it means lower costs, longer battery, smaller devices, and it’s coming out of startups as well as the incumbents. 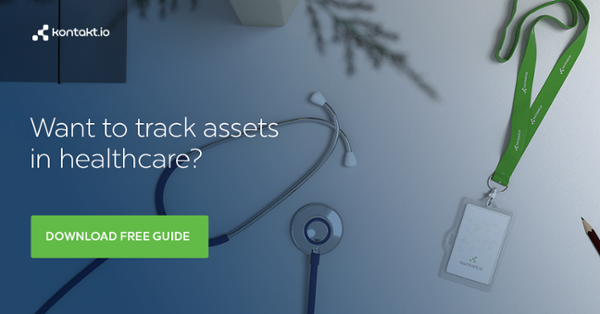 Stanley Healthcare is the current leader in RTLS technology for asset tracking, and they believe Bluetooth is the future as well. Bluetooth is poised to take over because real-time location services (RTLS) based on WiFi is too expensive, too complex, and requires a high-cost consultant to implement the network and solution. Customers will pay $250 per hour for a consultant to design the WiFi network, and most networks are still designed without RTLS as a requirement. Fixing it after install is even more complicated. Absolutely and in a variety of ways! Beacons will be part of solutions that help hospitals improve operational efficiencies, give caregivers more face time with patients, and prevent staff from spending unnecessary time looking for “missing” equipment. Beacons will also be used in even bigger solutions: helping prevent patient falls by notifying caregivers to unexpected motion or helping improve patient flow by making sure the right procedure rooms, equipment, staff and patients are all together and ready to go at the same time. Absolutely. The IoT infrastructure of the future for healthcare will need to be very dynamic to address the more than 120 use cases. Beacons will play an increasingly critical role in a large number of these as they present opportunities to address both current and new use cases in better, more cost-effective ways. Everyday we read about new technological advancements in sensors, and how much more accurate, responsive, and less expensive they have become. This is especially true with beacons, where the possible ways of using them in healthcare are growing exponentially – from wayfinding, asset tracking, and patient flow, to advanced time and motion studies and more. Making RTLS work in healthcare is complex, and Mark’s team have done it more than 300 times. Listen to their detailed insights here. What’s holding hospitals back from investing more in IoT solutions? The internet is abuzz with talk of Digital Health and awesome, cutting edge healthcare technology solutions. So why don’t you see them at your local hospital? There are several blockers administrators face when it comes to implementing new systems. Customers and vendors are worried about security, and the concerns are valid but can be addressed. However, privacy concerns are larger roadblocks in certain countries such as Sweden, Germany, Australia, where laws are implemented to protect privacy. In the healthcare space, privacy is even more important. BLE solutions like all IT solutions will be required to meet HIPAA and all of its privacy regulations. Solution providers must have privacy controls, store their data securely, and inform customers what is done with the data. What’s holding hospitals back from investing more in IoT solutions? Costs of implementation. Honestly? Nothing. Those that appear slow to adopt today’s technology are likely early adopters who previously invested in slightly immature RTLS technologies and didn’t realize the benefits they originally anticipated. Hospitals are battle ships. While they battle disease, they also have tremendous mass and inertia. Of course, this is driven by both the necessity for critical mass to manage both care and costs. But it’s hard to turn a battle ship. And mid-course changes and corrections are hampered by human and functional concerns. Innovation in Iot requires intellectual capital—the risk associated with innovation—and frequently, “good enough” is acceptable to “maybe better” in the evolution of technology in healthcare. I believe that this still is a fundamental obstacle to investment by institutions. I think the biggest challenge that is holding hospitals back from investing in IoT solutions is lack of best practices that would help healthcare organizations develop and execute the right IoT strategy – the right strategy for the organization of their size, specialty, and technological know-how. We need to encourage our peers to share what has worked and what has not when it comes to IoT deployments and adoption. I also think the maturity of the technologies are quickly advancing such that we will begin seeing faster “time to value” due to faster deployments and lower upfront costs. Currently, the majority of hospitals are not investing in ANY digital innovation, and CEOs often state that they see ROI as unclear. This is no doubt linked to the recent billions spent on EHR systems that have in many cases reduced hospital revenue, and increased security vulnerabilities (e.g. with ransomware attacks), while worsening patient experience. How will hospitals decide what to invest in? There’s a clear gap between solutions available and the solutions that will come out on top. It’s clear hospitals will need more convincing in many situations, but our experts pinpointed a few, very specific facets all hospitals will be considering when investing. Like the education market, hospitals often share information and case studies with each other. However IT can be defensive and do not necessarily have the staff to run an asset tracking solution. The IT budget may need support from a department, and they can provide a managed service to each department. The radiology department will want to track mobile X-ray machines. The nurses will want call buttons for safety reasons. IT wants to track IT carts. It’s important to get buy-in and consolidated requirements – or a customer ends up with mutliple asset tracking strategies. Meraki is helping the IT department simplify and make their jobs easier, and we made a big bed on Bluetooth by making it part of all of our access points. Customers are willing to take bets on newer technology like Bluetooth low energy, but for IT to build and manage the solution it must be stable, secure, and reliable. Hospitals are facing several revenue challenges. Most will invest in solutions that solve for a particular pain point like better management of medical device inventory, loss prevention, environmental control, or patient satisfaction. Solving for particular pain points ensures earlier adopters see immediate returns while laying the foundation to easily deploy future use cases. With healthcare services reimbursement rates going down and a shortage of healthcare workers, hospitals need to focus on getting work done in a less costly manner and with less resources – all while not sacrificing quality of care and patient experience. This is a difficult but doable task. We are working with several hospital systems which were able to achieve increased utilization of their resources and cost savings by deploying IoT solutions and who are coming up every day with new ways of leveraging the IoT infrastructure for additional uses. CEOs and CIOs are gun-shy from their experience with EHRs that have overpromised and underdelivered. Their next investments are very unlikely to be subsidized by the government (as EHRs were), and so they will choose technologies that have a very, very clear return on investment. Hospitals need ways to make their processes more efficient and safe for patients, and there is tremendous potential for process improvement using big data analytics (for example), but now that the hospitals themselves are paying they will need a lot more convincing. What do you think technology in healthcare will bring in the coming quarters? Is 2018 the year of the Smart Hospital or is it just a single stepping stone? Share your thoughts with us.